FROST custom wine Holiday Gift Basket. Photo courtesy of FROST. From a FROST news release. Frosty the snowman would probably have been a lot more jolly with a gift basket from FROST this Holiday season! 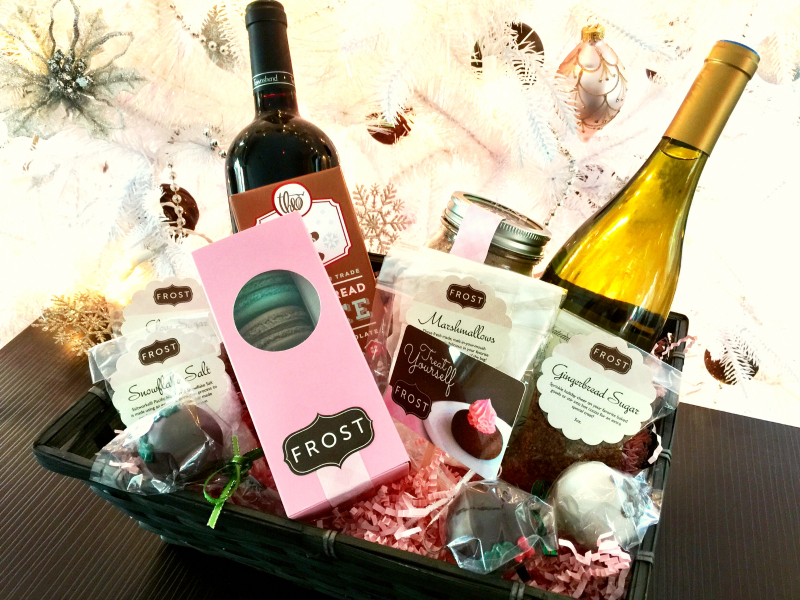 FROST Dessert Lounge in Mill Creek has a variety of Holiday Gift Baskets available for pre-order that will make the perfect gift for family and friends. All baskets include a FROST gift card, packaged FROST baked goods, and other unique gifts such as house made salted caramels and fresh marshmallows! More information about the baskets and to pre-order online, please visit: http://frost.formstack.com/forms/gb2014 or call (425) 379-2600 to reserve your gift basket. Baskets can be pre-ordered now until Tuesday, December 23. Baskets will be available for pickup at the store until Christmas Eve, or until supplies last.